The mission of the Soyuz TMA-13 (No. 223) spacecraft, taking off in the fall of 2008 had a goal of delivering and returning the 18th long-duration crew to the International Space Station. 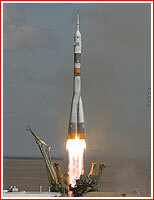 The launch of the Soyuz FG rocket was scheduled for Oct. 12, 2008. (In preliminary schedules, the mission was planned as early as September 2008). During the flight to the station, the Expedition 18 crew was joined by an American "spaceflight participant" Richard Garriott flying under a commercial agreement with the Russian space agency, Roskosmos. He would return to Earth with Expedition 17 after 12 days in orbit. Sandra Magnus flight engineer NASA Joins Expedition 18 in progress. She is to replace Greg Chamitoff during STS-126 in November 2008. Aerospace Exploration Agency Joins Expedition 18 in progress. He is to replace Sandra Magnus during STS-119 in February 2009. 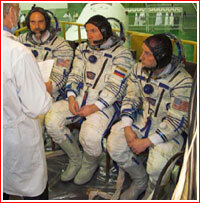 Richard Garriott Tourist US, private Up only; returns onboard Soyuz TMA-12. The new expedition heads to the International Space Station, ISS, after a successful launch from Kazakhstan. The Soyuz FG rocket blasted off from Site 1 at Baikonur Cosmodrome on Oct. 12, 2008 at 11:01:33 Moscow Time (07:01:33 GMT), carrying the Soyuz TMA-13 spacecraft. Onboard were members of Expedition 18 Russian cosmonaut Yuri Lonchakov, NASA astronaut Michael Fincke, along with an American space tourist Richard Garriott. Garriott, a 47-old computer game developer and a son of NASA astronaut Owen Garriott, reportedly paid between $30 and 35 million for a 12-day ride in space. After a two-day autonomous flight, the Soyuz TMA-13 successfully docked to the nadir (Earth-facing) docking port of the Zarya FGB control module of the station on Oct. 14, 2008, at 12:26:14 Moscow Time (08:26 GMT), just seven minutes ahead of schedule. Expedition 18 is expected to last 173 days, while Richard Garriott should return to Earth onboard the Soyuz TMA-12 with the members of Expedition 17. Commander Mike Fincke and Flight Engineer Yury Lonchakov of the 18th International Space Station crew landed in Kazakhstan on April 8, 2009, at 3:16 a.m. EDT after about six months in space, NASA said. With Fincke and Lonchakov was spaceflight participant Charles Simonyi. He launched to the station March 26, 2009, with the Expedition 19 crew, Commander Gennady Padalka and Flight Engineer Michael Barratt, under contract with the Russian Federal Space Agency. Helicopter crews were able to videotape the final phase of descent of the Soyuz capsule, including the firing of the soft-landing engines and the touchdown. The capsule landed on its side after landing, probably due to strong winds in the area. 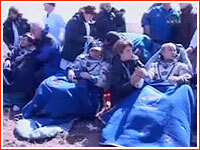 A Russian recovery team and NASA personnel reached the landing site by helicopter shortly after. They helped the crew members into reclining chairs for medical tests and set up a medical tent nearby. All three people aboard the Soyuz TMA-13 spacecraft were reported to be in good condition after their re-entry and landing. Japan Aerospace Exploration Agency (JAXA) astronaut Koichi Wakata came to the station aboard space shuttle Discovery on its STS-119 mission, launched March 15. He served for the last part of Expedition 18 as a flight engineer. He remains aboard the station as a member of the Expedition 19 crew. Wakata is the first resident station crew member from JAXA. Expedition 18 crew members undocked their Soyuz spacecraft from the station at 11:55 p.m. EDT on April 7, 2009. The deorbit burn to slow the Soyuz and begin its descent toward the Earth took place at 2:24 a.m. on April 8, 2009. When they landed, Fincke and Lonchakov had spent 178 days in space on their Expedition 18 flight, 176 of them on the station. Fincke, a colonel in the U.S. Air Force, returned from his second stay at the space station. He previously served as flight engineer and NASA Space Station science officer on Expedition 9 in 2004. Lonchakov, a colonel in the Russian Air Force, completed his third trip to the station. He was a mission specialist on STS-100, which visited the orbital outpost in 2001, and he returned to the station in 2002 as part of the Soyuz TMA-1 crew.